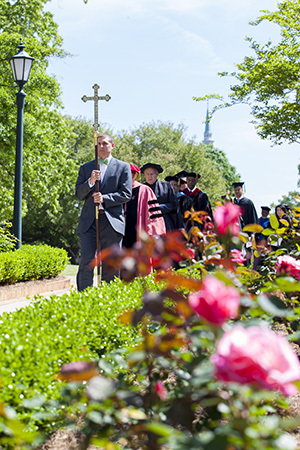 Samford University's Beeson Divinity School celebrated its 25th anniversary Tuesday, April 23, with special activities to commemorate its beginning and first quarter-century. It was appropriate, said founding dean Timothy George, "to pause at this mile marker to thank God for his blessings and mercy to this institution." The school opened its doors to an entering class of 32 fulltime students in the fall of 1988. Almost 1,000 graduates, serving in many kinds of ministry throughout the world, now claim master's or doctoral degrees from Beeson. References to the school's being ecumenical, evangelical, missional and committed to "training preachers to preach" were echoed by guest speakers and others. The commemoration began with a processional from the statue of the school's founding benefactor, Ralph Waldo Beeson, to Andrew Gerow Hodges Chapel in the building that houses the school. At the worship service, Samford president Andrew Westmoreland confessed that, as a college administrator in Arkansas in 1988, he had doubts for the success of the new school that was being opened at Samford. "It was the worst prediction in the world," Dr. Westmoreland told the audience in the chapel that is named for one of the early supporters of the school. He was proven wrong, he said, because of the far-reaching foresight of then-Samford president Thomas E. Corts, a unified faculty that was committed to each other and the students, a student body that clearly felt a call to ministry across the globe, the vision and wisdom of Dr. George, and the hand of God in the entire process. Norfleete Day recalled how she was one of the 32 eager students who gathered with excitement and trepidation to begin a journey "that only God could have brought about." "My life was profoundly changed by Beeson," said the former librarian who later earned a Ph.D. and returned to join the Beeson faculty. "This school is inextricably interwoven in my life." Frank Thielman said he was attracted to Dean George's invitation to become one of the first faculty members because of the school's commitment to a theological education that was practical, missional, ecumenical and evangelical, and was "founded on the belief that the Bible is the word of God and should be the basis for furthering the Lord's work." Master of Divinity student James Sutton, representing the current 153-member student body, noted the "humbling" feeling of being a part of the very special "Beeson D.N.A." Retired Anglican minister Richard Bewes of London, England, using Old Testament scripture to call for a time for revival, urged his audience to heed the verbs of command in Jeremiah 6:16: Stand at the crossroads and look; ask for the ancient paths, ask where the good way is, and walk in it." He told how a 1,400-year-old Yew tree that had been destroyed by a 1990 storm in Selborne, England, could be symbolic of what can happen to people and their belief systems. To outward observation, it may appear that Christian faith once seemed so securely rooted and embedded in the U.S. and England, is gone, or for some, might never have been, said Bewes. "Let's say it to each other, every generation has to learn these Gospel lessons all over again, and has to fight the same battles all over again. People forget so soon! Preachers must keep praying, believing and proclaiming-and expect to hear that little voice inside that whispers, 'The Lord will use you.'" "Revival takes place in your soul and mine, when the way of the Cross becomes our daily experience," said Bewes, former pastor of All Souls Church in London. Matt Swale, a master of divinity student from Illinois, enjoyed the special worship service. "I appreciated the speaker's emphasis on how each generation needs to own the truths of the gospel and be revived," said Swale, adding that the anniversary year is a special time to be a Beeson student. "It is an honor to see how the first generation of Beeson graduates, such as Norfleete Day, have lived their faith and served the Lord." Later in the day, church historian John D. Woodbridge described the divinity school's role in the shaping of evangelical Christianity. Speaking to members of the Beeson advisory board, Woodbridge noted that in the history of higher education, many institutions that were launched by evangelical Christians have capsized or abandoned their course so as to be no longer recognizable as Christian schools. When Beeson opened in the 1980s, there was not always agreement about what traits identified an Evangelical Christian. Biblical inerrancy, the sometimes negative baggage that went with the "fundamentalist" label, the blow to evangelical's reputation and charge of hypocrisy in the wake of moral failures by high-profile television evangelists…all factored into it. In that context, the need for a new evangelical school that was associated with a first-rate university and characterized by a generous orthodoxy, a commitment to gospel preaching and the total truthfulness of the Bible, a loving attitude toward neighbors, the practice of Christian disciplines and respect for the life of the mind, was patent, said Woodbridge. "The founding of Beeson Divinity School in 1988 was timely indeed in God's providence. Beeson's modeling of a winsome evangelical divinity school constituted one of the earliest major contributions to shaping American evangelicalism," said Woodbridge, research professor of church history and the history of Christian thought at Trinity Evangelical Divinity School in Deerfield, Ill.
What the new dean George lacked in the way of facilities, faculty, curriculum and students in 1988, he compensated for with an understanding the times and a vision to develop a program of quality theological education in a Christian university setting from an explicitly evangelical perspective, said Woodbridge. Beeson's founding also coincided with a time of struggles within the Southern Baptist Convention, but Woodbridge noted George's wise assertion in his inaugural address that the school would be "neither a haven for disaffected liberals or a bastion of raucous fundamentalism." The good ship Beeson, said Woodbridge, launched with the Lord Jesus Christ as its clearly identified captain, had three potentially dangerous shoals to pass and avoid during its first 25 years: the adoption a contentious spirit, making trendy but unwise curricular accommodations, and yielding to unbiblical moral compromises. The jagged edges of any one could have damaged the ship. The SBC debate, which could have easily created a contentions spirit among faculty members and students, generally did not, observed Woodbridge. And the focus to steer away from a less demanding and trendy educational curriculum that would downplayed theological understanding has sustained a high academic level of study at Beeson. Beeson Divinity School contributed to the larger evangelical world by providing a "distinctive model of theological education quite unlike one found at most any other divinity school," said Woodbridge. "At this port of call for the good ship Beeson-the 25th anniversary-the ship in God's grace looks like it is in superb shape," said Woodbridge. He noted the school's commitment to racial reconciliation, its intentional effort to involve women students and women faculty in key roles in teaching, preaching, and leadership, and its leadership in bridge-building between evangelicals and Catholics. Despite its success at avoiding the three big treacherous shoals, Woodbridge warned against letting complacency get in the way. "Complacent people do not sense the need to seek the Lord's help in ministry and blessing upon their studies and plans," he said, repeating a scripture from Psalm 127: "Unless the Lord builds the house, those who build it labor in vain. Unless the Lord watches over the city, the watchman stays awake in vain." With this in mind, he said, "The good ship Beeson, its compass firmly fixed on Christ, is well fitted to sail once again for its next 25 years on its evangelical mission."